Before you read this: play the video, but then read this during the song. There is a better version that will be watchable below, but listen to this, as it is more aesthetic for listening. Persepolis is simply amazing, it is touching, witty, and above all else accessible. At first, I felt that the art got in the way, but only at first, since I liked the art. I found that I was immediately, and dangerously intertwined with the characters of the story. When the uncle was executed, after that final bread-swan was given, I had to breathe deeply lest I shed a very real tear. I found it hard to look at the text objectively since I have found it do be so deeply moving. The accessibility is what really drew me in. How was it more accessible than the other texts I have explored within the last couple of months? The artwork. Where the dialogue was more than sufficient, I felt that the main narrative of the text was the artwork. Children learn more about a situation from the looks on their parents faces than anything else. By making the characters visibly emotional coupled with the little one line narrations attached to odd boxes, every page was far more informative than a full page of text crammed with descriptions of colors, sizes and shapes. Describing a shape or color is nothing like actually experiencing it, so telling this story through the artwork was excitingly effective. Looking at this text from an objective point of view, not an easy task mind you, I have found that this set of ‘comics’ was insanely political. Almost every frame was filled with commentary on life in the times, and how it was shaped from the past, and shattered with a terrifying ease. I found that certain symbols within the societies that were being banned became even more meaningful because they were forbidden fruits. Some of these ‘fruits’ are ones that every child yearns to taste. One of these is cigarettes. In the story, yet another uncle that has been beset by many heart attacks said to his wife on page 188 that he would rather smoke a cigarette since it was far safer to smoke than the stress he gets from hearing each gunshot. This is where our main character lifts her cigarettes from, and how she goes through the painful experience of becoming a woman. Rather than losing her virginity, her ‘cherry’ (The glowing part of a cigarette) burns and shines as she ignites her new womanhood through the experience borne of rebellious growth. This ceremony is seen on page 117. These ceremonies seem to be a necessary rebellion in order for the citizen of Iran to survive. From parties, shown in page 106, to Iron Maiden posters being smuggled in, the informed and active middle class (or what was middle class), needs these vestiges of their older lives in order to remain sane. Here is a music video showing some of the madness that is felt through this story. After that, there is a rather funny, yet very serious message in the next video. Eye of the Tiger Cover from Persepolis. Perf. Satrapi. 2012. Youtube. Eye of the Tiger. Perf. Chiara Mastroianni. 2010. Youtube. Nima Jam – Persepolis Music Video “Star Child” . Perf. Marjane Satrapi Nima Jam. 2012. Youtube video. Pulp, Culture. 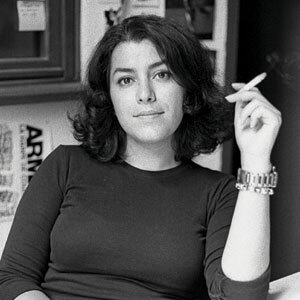 Marjane Satrapi Smoking. Culture Pulp. THE CULTUREPULP Q&A: ‘Persepolis’ creator Marjane Satrapi stock photo. n.d. Photograph. Satrapi, Marjane. Color smoking girl. Persepolis. n.d. Photo from film. This entry was posted in Persepolis and tagged Marjane Satrapi, Persepolis by wayneceallaigh. Bookmark the permalink. Wayne, I completely agree with the accessability of this graphic novel. With the short little puns and the pokes at the very policial side to her world, the story came together through the art work. I began to wonder what the book would be without the faces, but I can’t even imagine! I think the idea would still work, but the jokes wouldn’t be able to be included, and that is why keeps this narrative from getting to serious at some moments. The little girl’s sassy attitude and spunky personality wouldn’t have came through in the same ways, so again, I agree with you! The format used is perfect.